For me, this week was really interesting. For quite some time now, I have been buying all my vegetables and fruit at a local store just around the corner, where the produce is not wrapped in plastic. So, I was pretty sure I’d be able to reduce my kitchen waste – and also my general waste – to a minimum. It worked very well, besides the cap of my favourite milk chocolate drinks. Something maybe not everyone of you knows: in Austria, most of these cartons the use as packaging (commonly used for milk and other liquids like juice or smoothies) can be recycled, besides the cap of course, which is just plastic. Another piece of waste I produced that week, which I am not proud of, is a food wrapper. Innsbruck is a city where supermarkets are closed on Sundays and I miscalculated a bit when it came to how much food I had at home; suddenly, it was the weekend and I ended up at home during dinnertime without anything left to eat. So, in the end, I ate some food that came in a carton box, but inside that, it was still wrapped in plastic. This is definitely something that could have been avoided, but I was surprised how well being ‘plastic free’ already has been working in my kitchen. But now, let’s head to the bathroom. I used 2 cotton pads during that week. I already have the reusable ones on my to-buy-list, but I still own lots of the cotton ones and the only thing that’s even worse than using something for 5 minutes before throwing it away, is not using it at all. I use them to take off my make-up, but since I barely wear any makeup and really try my best to use every single part of the pad, I only needed 2 for a whole week. This was not something I started doing because of the challenge, in fact, I always use very few cotton pads. Still, there are some products that I use, that could be eco-friendlier, like my shampoo and shower gel. With the shower gel it’s similar to the cotton pads, I refuse to buy a new – plastic-free – one, until I have used up my old one. When it comes to my shampoo I still don’t know how I’ll handle that in the future. I struggled a lot in my past with my hair and had to change shampoo ever few weeks or months until my hairdresser finally found a great one that works for me. That’s why I’m not keen on changing that in the near future – but I don’t even have to when considering I used my old one (125 ml) for nearly a year, and just recently I bought the biggest size (400 ml) which will, presumably, last me for years. This challenge was really interesting for me, since I assumed it would be harder to focus on not buying goods that contain waste, but in the end, I realized that especially when it comes to food, I’m on the right path. Since I did not buy any new items that were necessary, I guess I’d be able to continue producing this amount of waste (or even less!) in the future as well, and even now, a week after the challenge is over, I have more or less continued with it. 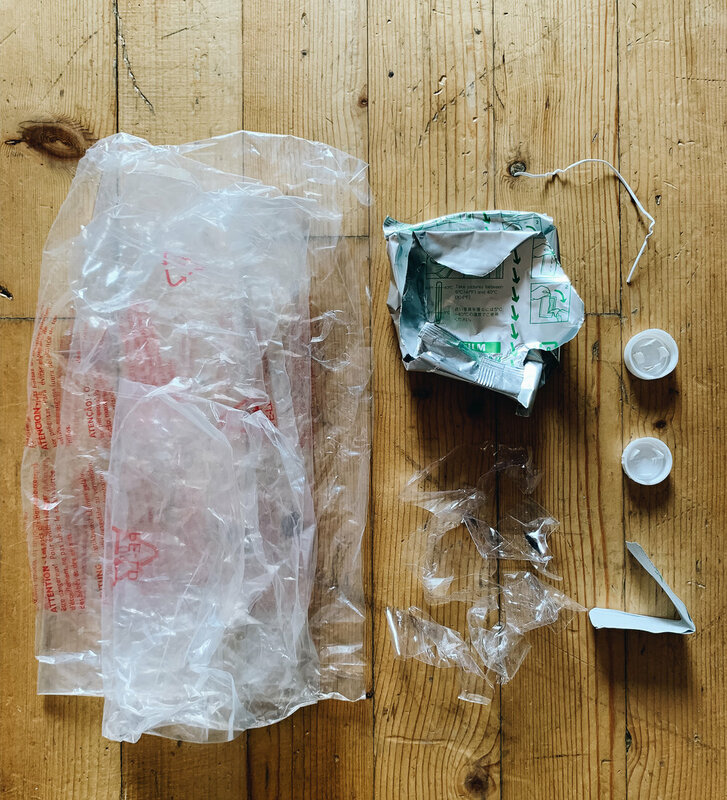 Ever since hearing Lauren talk about plastic waste and how dangerous our habit of throwing away so much on a daily basis really is, I looked at things differently. I started to notice single-use plastic products everywhere I went and tried to avoid them as well as I could. Yet I never set myself the challenge to life a zero-waste lifestyle. Why, you might ask? That is a good question. The short and simple answer to it is: convenience and laziness. Here are some other changes I made: I decided to repurchase the naked shampoo and conditioner bars from Lush, which I had already used before and loved. Halfway through the challenge, I actually ran out of tooth paste and found an eco-friendly, zero waste alternative, which is a tooth powder (I will let you know how I get on with it, but, so far, so good). I have been using a bamboo toothbrush for about two years now, also, and I love it. Like Natascha, I started buying my fruit and vegetables at a small local shop; and grains, legumes, spices and herbs, tea, nuts, and other foods at a package free shop that I discovered when doing a bit of research prior to the challenge. Like I said, being prepared is everything. Another thing I bought are bees wax wraps to replace plastic wrapping. However, I did encounter a few problems as well: I could not find package free soy milk and coconut yoghurt. I always chose for the eco friendliest option, however, there is always at least a tiny bit of plastic involved. Other waste I produced this week is the packaging for new pictures for my polaroid camera, a wrapper from some unnecessary glow sticks I got at a party (and clearly didn’t think about whether I needed them or not), and the packaging from a new hairdryer I bought. 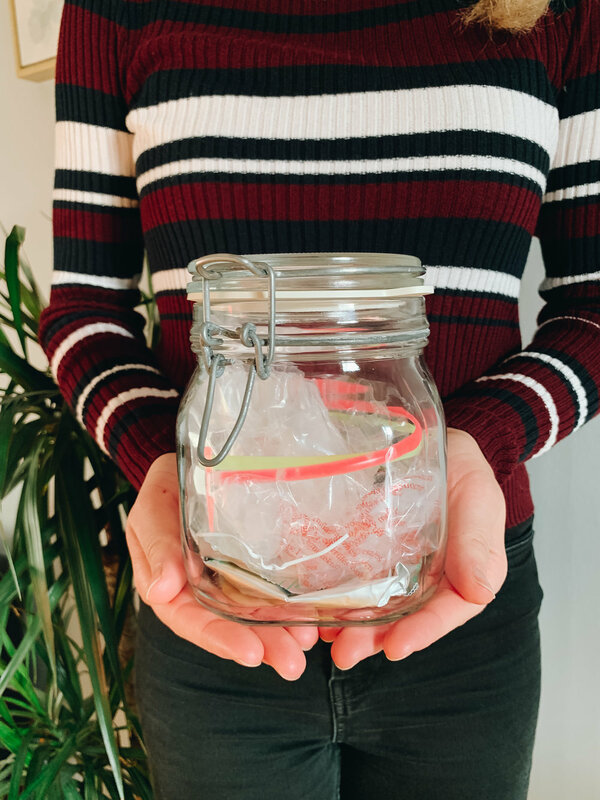 Altogether, I am really proud of myself for creating significantly less waste than I have ever before, and I am sure that I will continue embarking on this journey and trying to find more zero waste alternatives as I go on. Because just like Natascha said, better use something up that you have already bought instead of throwing it away half empty and wasting it completely. When Sophie and Natascha asked me if I wanted to “go zero waste” with them for a week, I was very excited. But going “zero waste” was not that easy for me. I still live with my parents and therefore I also produce much more waste than Natascha and Sophie, since I live in a 4-person household. So, before going “zero” waste I really had to think and plan ahead in order to not use anything with plastic. I also had to explain this experiment to my parents, because I think communication is key in our relationship. They thought it was great, but obviously I didn’t want to force the “zero waste lifestyle” onto them. When it comes to grocery shopping, it was not that difficult cutting down on products wrapped in plastics, because my parents always buy vegetables and fruit without a plastic wrapping. One thing we also always do is bring a box with us to put our groceries in. We did not buy any noodles, grains or even couscous at the package free shop because we already had all those things at home, and it would have been a waste of money to buy everything again. My mom and I are planning to check out the packaging free shop in Innsbruck as soon as we are out of those things. However, when my mom bought my favourite kind of Gnocchi at the local supermarket, I couldn’t resist eating them, even though they were wrapped in plastic. One challenge I set for myself was to have a completely plastic (or even packaging) free beauty routine. I have been using the solid shampoo bars from Lush for some time now, and I am a huge fan of them. They smell great, they clean my hair as well as any packaged shampoo would do, they lather up nicely and they last for a really long time. Another thing I tried is a naked shower gel and a naked body conditioner from lush. To be honest, I don’t like the body conditioner. It doesn’t work on my skin, I got a rash from it and the scent is already starting to annoy me. The shower gel, however, is really nice to use and does a wonderful job. So, I definitely suggest you try the shampoo bars (a less expensive version of the shampoo bar can be found at dm) and the naked shower gel. When it comes to skincare, I use a conditioner in a glass container from my mom and my tooth brush is an electrical one. I surely have produced less waste than before, and I will continue this path of producing less waste.